Simple steamed cauliflower is a tasty treat with just a sprinkle of salt, in my book. But variety is the spice of life, and while many people will choose to douse steamed cauliflower in scads of creamy cheese sauce (and I don't fault them one bit—that's a delicious choice), I find a bit of pesto can lift cauliflower to delicious new heights. I like to use homemade pesto, since it's just whirling up fresh basil, garlic, pine nuts, lemon juice, Parmesan cheese, and olive oil into a bright green paste (I make and freeze large batches of the stuff when basil is in season to get me through the doldrums of eating locally when winter comes). And while the homemade stuff is glorious, a quality store-bought variety works, too – feel free to doctor it up with more salt or lemon juice or Parmesan cheese for an extra kick of flavor. Trim the cauliflower. Trim off and discard the leaves (or save them to cook up in a stir-fry, mich as you'd use cabbage). Cut out the core. Many people will choose to discard the core, but there is no reason not to chop it into bite-size pieces and include it in the mix. Cut the rest of the head into florets. I like to keep them more or less bite-sized for even cooking and easy eating, but the size is entirely up to you. Steam the cauliflower until tender. Many people will choose to steam the cauliflower in a microwave, which is a perfectly fine option (put the cauliflower in a microwave-safe bowl with a scant bit of water at the bottom of the container, cover, and microwave on high in 30-second increments until the cauliflower is tender, about 3 minutes total. For the best and most even texture, put the cauliflower pieces in a steam basket over real boiling water, cover, and steam until the cauliflower is as tender as you like, 5 to 8 minutes for fully tender pieces. Transfer the cauliflower to a serving bowl. Top it with the pesto to taste. You can serve it as pictured, with the pesto dolloped over the cauliflower for a more dramatic presentation. 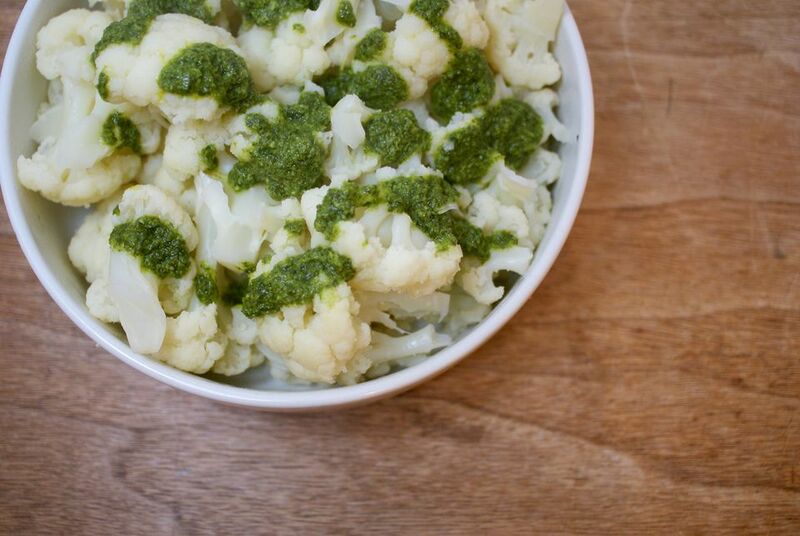 For the best taste, though, toss the still hot steamed cauliflower with the pesto to coat it thoroughly. Once ready, top with finely grated Parmesan cheese, if you like, for more flavor and lovely presentation. Serve hot, warm, or at room temperature.